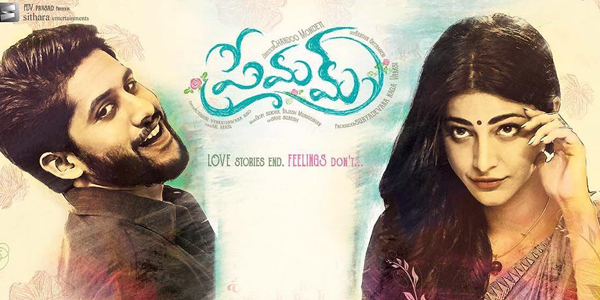 Eurotolly films , one of the leading players in Europe(Exculding UK) market for Telugu movies acquired theatrical screening rights for Europe(Exculding UK) market of Naga Chaitanya and Shruthi Hassan ‘s a coming-of-age musical romantic entertainer ‘Premam’ with tag line “Love Stories end. Feelings don’t”. Chandoo Mondeti is directing Premam where lead roles were played by Nag Chaitanya, Shruthi Hassan, Anupama Parameswaran and Madonna Sebastian followed by Jeeva, Brahmaji, Narra Srinu, Praveen, Chaitanya Krishna, Aravind Krishna, Satya, Karthik, Noel, Jogi Naidu, Krishnam Raj, Eeshwara Rao. Music is being composed by top Malayalam melody makers Gopi Sundar and Rajesh Murugeshan. Our heartfelt thanks to Mr. Srini Unnam garu Blue Sky Cinemas for giving this opportunity to Eurotolly. Get ready for this 2016 for a cool musical romantic entertainer!